This is a parchment certificate issued to each soldier on discharge from the Army or on transfer to the Reserves. The parchment was a form of identity and could be used to show employers proof identity, character and why they had not been civilian employ. These are not common at all. 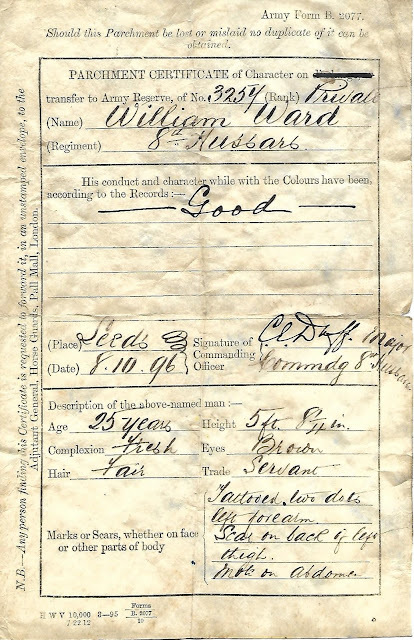 This certificate was issued to William Ward who had served with the 8th Hussars and was discharged at Leeds on 8th October 1896 to the Reserves. While on the Reserves Ward was liable for call up for the period remaining of his 12 year enlistment. 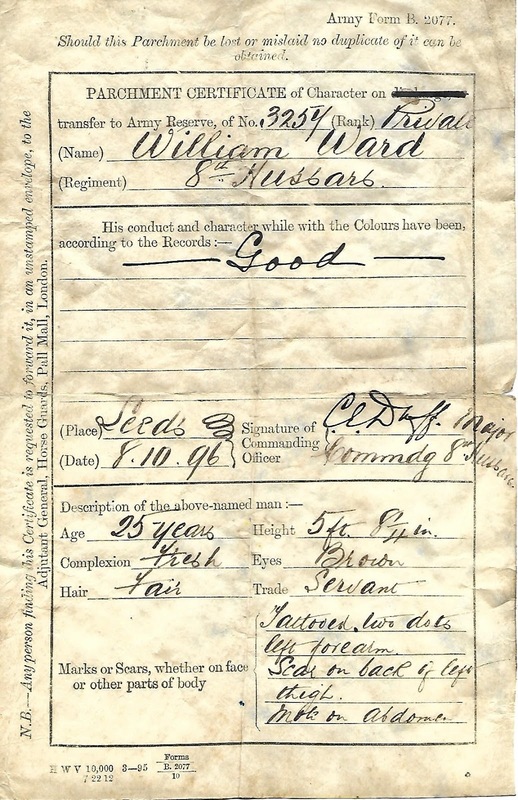 Ward's service papers exist on FindmyPast. They show he was born in Banbury, Oxfordshire and enlisted age 18 in 1889, he was a servant. He was recalled for active service in the Anglo-Boer War on 28th December, 1899. He served twice in South Africa, probably being invalided due to illness. He earned the QSA with clasps, Cape Colony, Orange Free State and King's South Africa with two date clasps. He was finally discharged in August 1902. Handicrafts made by Boer prisoners of war are well known and well collected. Less well known examples are boxes made for the medals of British soldiers guarding the Boer POWs. The example shown here was made in Trinchinopoly (now Tiruchirappalli), Tamil Nadu, southern India. This was the location of the largest POW camp in India (and Pakistan). The box was made for Pte 4307 JH Stocks, 1st bn Lincolnshire Rgt. The 1st bn had fought in the 1898 Sudan campaign at The Atbara and Khartoum. After the successful conclusion of the campaign the battalion was sent to India, when the Boer POWs arrived they became the camp guards. 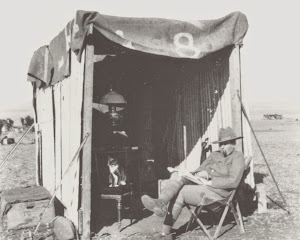 The 1st bn did not fight in South Africa but became intimately involved in one of the most unusual aspects of the war; guarding POWS in areas on the British Empire remote from the scene of fighting. Inside the box are Stocks' two Sudan Campaign medals. The box maker's name is 'J Viviers'. The only ‘J Viviers’ I have traced at Trichinopoly is a JPW Viviers who was wounded and POW at Dewetsdorp (December 15th, 1900), he died of his wounds in India on April 2nd, 1902. A similar box to a Pte 4349 W Breeze Lincolnshire Rgt was sold at auction in the UK in November 2011. John Stocks was discharged from the Army in 1903 when he returned to the UK. He married in 1904 and settled in Hemsworth, Yorkshire where he became a postman. There is splendid picture of John (Jack) with his wife, Myra, and young niece on an Ancestry family tree. John re-enlisted in September 1914 into the Lincolnshire Rgt. He served with the 6th bn at Gallipoli, Somme in July 1916 (but not the first day), Flers-Courcelette and Thiepval. John was transferred to the 8th bn and took part in the battle of Arras 9-12 April 1917. He was presumed dead on April 20th. He has no known grave and is commemorated on the Arras Memorial and the Dewsbury Memorial in Yorkshire.